Before we get to that, a little tangent that we had to get out of the way first. Zeke had some crazy notion that if you grill with a little Stagg Jr., that your meat would turn out better. That has to be one of the craziest statements I’ve ever heard in my life, but I decided to let him try it. In this instance, the results are not surprising. FYI, if you’re grilling/cooking and are thinking of trying a higher proof whiskey to do it, DON’T WASTE YOUR MONEY! The cooking process will cook away all your alcohol and you just happened to have cooked using a whiskey that costs a little more. Take it from me, I cook with Evan Williams Green Label (80 proof and $10). Take a look at my steak I cooked on Sunday below and tell me what you think. Is this something you think you’d be interested in eating? What bourbon/whiskey do you normally cook with? But anyways, onto the bourbons. Weighing in at a steamy 132,2 proof out of the great state of Kentucky, Stagg Jr. 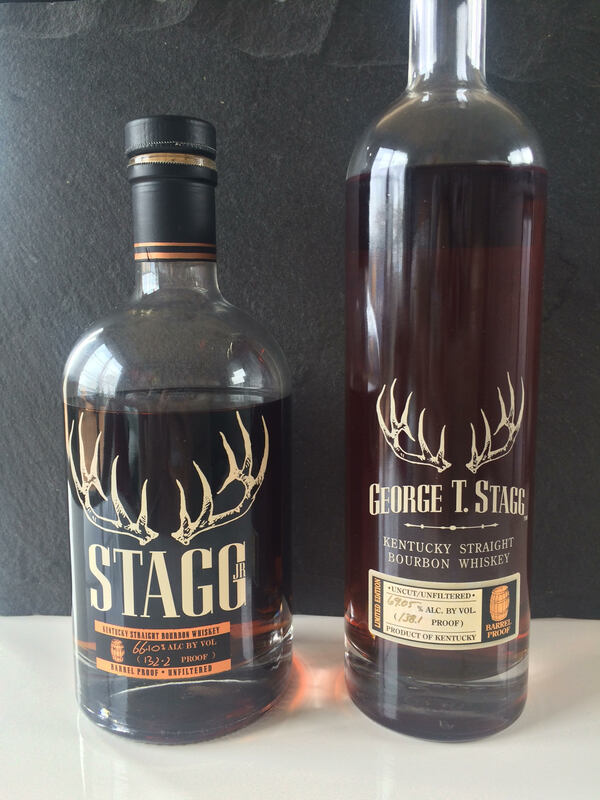 In the opposite corner, weighing in at a sweltering 138.1 proof also from the Bluegrass State, George T. Stagg! For the millions reading at home, LLLLEEETTTSSSSS GGGGGGGGGGGGGGGGEEEEET READY TO DRINK THEMMMMMMMM. Let’s start with the Stagg Jr.
Well shoot, I certainly didn’t get all that from the Stagg Jr. I did taste fruit and tobacco, but I got a lot of heat with a lot of it landing in my chest. Don’t get me wrong, I found it enjoyable as a daily go-to, but it didn’t knock my socks off and I also didn’t find it very complex. Onto the George T. Stagg… It should also be mentioned that this particular GTS was from 2014, if that influences your opinion at all. Zeke’s take: “Although the proof is higher, at 16 years and 4 months, old age has been very kind to George T. Stagg. This bourbon is much more refined & polished. The nose packs a punch, but this one lacks he heat of Jr., giving off the hints of the fruit while also hinting at the beauty of it’s aging. The palate is almost on point to the tasting notes provided by Buffalo Trace: dates & chocolate. If you want to try to experience it yourself, think of being a little kid and your mom is baking and you steal one of the semi-sweet chocolates she’s using. The finish easily rivals any desert featuring frozen chocolate and fruit. For the age, it appears father time has merely allowed George T. Stagg to grow in proof, while also trading the astringent heat for bold and robust flavors. Wow, that was very well written… But here’s my take: “HOLY $&*#!”. Damn, I have never tasted a bourbon that high in proof that was so smooth. I found myself deep in thought thinking how could a bourbon be so high in proof but so smooth for a few minutes. Once I finally got over that, I did taste fruit, chocolate, and vanilla, but I couldn’t get over just how amazingly smooth and enjoyable this bourbon was. I did get some heat, but nowhere near what the Jr. brought and it was just that right amount to let you know it was there and that it cared enough to give you a hug. I quickly realized Zeke brought the GTS and I brought the Jr. I was then stuck on devising a plan to switch the bottles without him knowing before I left for the night, but unfortunately the bottles are just too different in shape and color. Ultimate Verdict: This one was tough because we went in thinking that for the value, the Stagg Jr. would easily be the better option. I think both of us were surprised how easily the George T. Stagg just blew us away compared to the Jr. I know that it’s becoming almost impossible to get the GTS, and secondary prices near or exceed $500, but if you ever have a chance to get this retail and it’s a reasonable price, don’t walk away from it. This experience was one of those life changing experiences for me that changed the way I thought about things. Sometimes you can get caught up on price since we’re all looking for the value play, but this one proves that something is priced around $130 when you find it retail because it deserves the price tag that goes along with it. Addendum to verdict: *If you are a fan of higher proofs served neat*, I would be so bold as to recommend buying at secondary price. Not frequently, but to have as an anchor to your bar presentation. The type of bottle guests marvel over, rarely opened but if/when it is, everyone knows something truly special is being celebrated & each person lucky enough to receive pour is reminded just how highly you revere them. When I acquired this bottle, I was told 2014 was supposedly “one of the better years”. This being the only release I have ever tasted, I cannot attest to how much each varies.